JEGS Small Block Chevy Harmonic Balancer/Damper 6.75"
JEGS Professional SFI Harmonic Balancers/Dampers are always SFI accepted and not only meet, but far exceed, SFI 18.1 Specifications! We tested our balancers to 20,500 RPM because that is all the test machine could handle! In a push-a-part strength test the woodruff key gave way before our balancer did!! Unlike most harmonic balancers manufacturers who injection mold and then cold bond the elastomer ring to the balancer, JEGS Harmonic Balancers are manufactured using a unique process which heat bonds, under extreme pressure, the dampening isolator to the center hub and the inertia ring. This process is proven to eliminate slippage and separation of the hub and inertia ring which is the common cause of harmonic balancer failure. 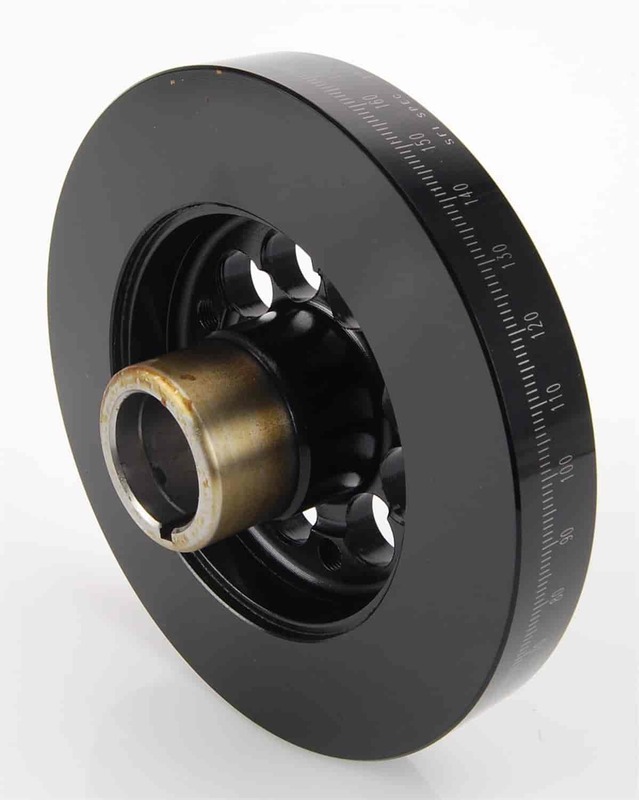 You will also find that many harmonic balancers use a billet aluminum hub. We use a Power-Forged steel hub. Not only does it provide greater strength, without added weight, but it also provides superior wear resistance. Wear resistance is critical to the durability of the oil seal and crank nose areas. All counterweighted JEGS Professional SFI Harmonic Balancers/Dampers have machined integral counterweights. Integral counterweights are more secure and accurate than bolt in counterweights, which can lead to engine vibration and other problems. Each balancer is precision CNC machined from 1045 steel, balanced to factory O.E.M. tolerances, has 360° timing marks and finished high gloss black finish for looks, strength and durability. Does JEGS 51601 fit your vehicle? 51601 is rated 3.7 out of 5 by 3.